The Galactica's scout ships find a Cylon baseship in the Lion's Head nebula, adrift and helpless. Apollo and Sharon (now flying under her new callsign, "Athena") lead a team onto the ship to explore. Among a multitude of dead Cylons, they find only five who are still, but only barely, alive. Apollo and Athena hurry back to the Galactica with these prize prisoners. Doc Cottle quarantines them all for study and identifies the virus that has infected the Cylon ship. Humans are immune to this particular pathogen — and so is Athena, as the mother of a half-human child. All other Cylons, however, aren't so lucky. While Cottle can design a vaccine that will halt the virus's effects, special antibodies in the Cylons' blood will soon destroy the vaccine. In other words, if the prisoners don't receive frequent new injections, they'll die. Tempted by hope of receiving this dubious cure, the Cylon prisoner Simon tells the humans everything he knows. He explains that the virus can be transmitted through the Cylon resurrection process, then mentions that Dr. Baltar is alive and assisting the Cylons in their quest to find Earth. Adama and Roslin are stunned by this revelation. In fact, deep in the heart of the Cylon fleet, D'Anna and Caprica Six have turned against Baltar. They believe that he knew about the virus all along and led them to the nebula in order to kill them. To make him confess, they torture him. Wracked with pain, Baltar flees to the comfort of the Six in his mind, who might offer his only hope for salvation. Back on the Galactica, Lee Adama has a chilling brainstorm: if they maneuver the Galactica within close range of a Cylon resurrection ship and kill their Cylon prisoners, the infected prisoners will then download to new bodies, spreading the virus to the Cylon fleet in the process. The disease will then rage freely throughout Cylon civilization, eventually wiping out the entire race. - Roslin: "The Cylons struck first in this war and not being content with the annihilation of billions of human beings, they pursued us relentlessly through the galaxies determined to wipe us out." Since when has the Galactica been traveling across multiple galaxies? Must be a bungled line. - Survivors, according to the main title: 41420. - The virus (lymphocytic encephalitis) was an exact match to one reported over 3000 years ago, right around the time that the 13th tribe left Kobol. It also contains a bioelectric feedback component which corrupts Cylon brains as well as their immune system, which is why it can be downloaded to the resurrection ship. - Tigh is notably absent from this episode. - The boarding party approaching and boarding the basestar. - The boarding party realizing that the Cylons were infected by a disease. - Simon telling the story of the infected basestar to the Colonials. - Simon telling the Colonials that Baltar is still alive. - Apollo proposing to Roslin that they use the disease to wipe out the entire Cylon race. - Helo arguing against genocide. 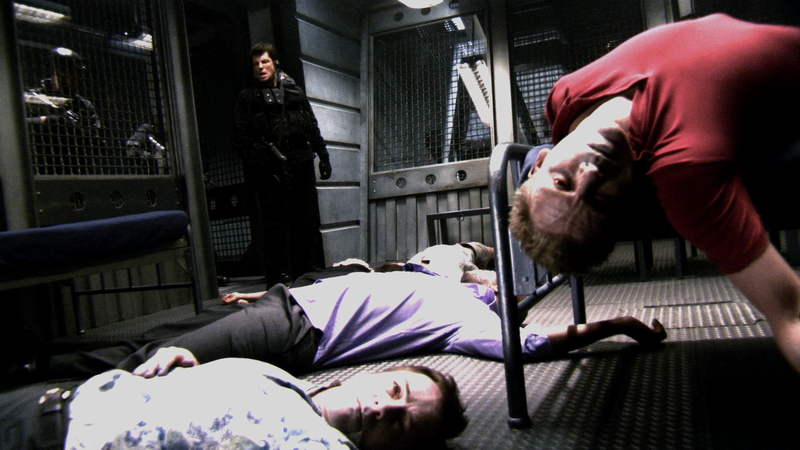 - Imaginary Six helping Baltar through the torture. - Baltar lecturing D'Anna on the hypocrisy of Cylon fundamentalism. - Athena revealing that Doc. Cottle discovered she's immune. - Adama: "Posterity really doesn't look too kindly on genocide." Roslin: "You're making an assumption that posterity will define this as genocide. If they do, at least there'll be someone alive to hate us for it. The Cylons are our mistake, we created them... All right Admiral Adama, as President I have determined that the Cylons be made extinct. The use of biological weapons is authorized." Adama: "So say we all." Roslin: "So say we all." - Adama revealing Cottle's findings regarding the origins of the disease. Here's an episode that could have easily earned a perfect score, but falls short. And flat. Strictly speaking, they should have went through with the genocide. The story doesn't come across anywhere near as dark and as moving as it would have if it had delivered on what it promised. Furthermore, Helo's entire disruption of the mission was done so sloppily that the episode barely even resonates as well as Star Trek TNG's I, Borg, from which it seems inspired. Let's imagine for a moment that this story is tweaked slightly and instead of diving into this mission like a bunch of amateurs, the prisoners are not left alone and an entire marine execution squad is with them at all times. They go through with their mission exactly as planned, then return to the fleet with a new sense of security. Unbeknownst to the fleet however, that sense of security is a false one. Contrary to what Apollo believed, the disease could never wipe out the entire Cylon race. The disease would probably wipe out all or most resurrection ships in the Cylon fleet and surely a great many individual Cylons would be killed permanently by such an event, but ultimately the damage would be limited only to resurrection ships. A severe blow to the Cylons, but not fatal. Alas, that story and its potential is lost, just like the Pegasus. There is still much to redeem this episode though. What I found most fascinating were the throes of emotion observable in Athena. Aside from the emotional complexities that must have plagued her by seeing fellow Cylons dying of a debilitating disease, only then to have believed contracted it herself, what interests me most is the fact that all evidence points to her destroying the Cylon basestar. To me, that signifies that part of her is still loyal to the Cylons, not wanting too much of their technology (such as a basestar) to fall into Colonial hands, but more importantly, knowing that no resurrection ship was in range, she felt that the basestar should be destroyed now to prevent whatever happened to the Cylons aboard from spreading to the others later. It also serves as interesting parallelism. Both of the significant Sharon characters are now responsible for the destruction of a Cylon basestar. Another interesting quip of the narrative is Baltar's torture scene. I'm fairly annoyed with how one dimensional the Cylons are becoming with regards to how they're dealing with Baltar, but I'm forgiving it because the layers depicted in the torture scene made it come across as quite well executed. It also gave me curiously fond memories of Scorpius torturing John Crichton on Farscape, which is a high compliment. The sloppy execution of the mission allowing Helo to do his dirty work wasn't the only wrinkle in the episode though. Another big one is the continued rank structure ambiguities. Helo is noted as having the rank of captain in this episode. But Apollo, with the rank of at least major, outranks him. Yet Apollo is not serving as the XO. Why? I suppose Adama is well within his rights to prefer Helo as an XO and Apollo certainly seems to have no problems with his new job or his apparent demotion, but come on writers! Throw us a bone here! Explain it all on screen! All it takes is one or two throw away lines to satisfy the fans' organizational concerns. So this was a pretty strong episode for the most part, but it could have been a lot better. In the end, it skirted around the issue of genocide, trying to have it both ways with the good guys committed to it, all except one, who prevents the catastrophe. Weak. I agree with you wholeheartedly about the rank thing. That's the exact kind of thing that irritates me, and as nitpicky as it may be, it's not that hard for the writers to throw in that one line of dialogue. The Cylons have killed 20-50 Billion humans and are hellbent on destruction of it entirely. They have committed genocide. Finally the remnants of humanity of a means of removing the threat and possibly preventing the last colony of humans from the same fate visited up the other 12. But they sit around arguing about crimes against humanity and when the moment comes, they do the usual thing and fail. This episode was utterly idiotic. No soldier risking life and limb and charged to protect their people from an such a peril as the Cylons would balk at using whatever weapons were at their disposal. The treason of the act wasn't even investigated. To me it'd be like Sarah Connor in Terminator 1 not crushing the Terminator but rather choosing to just let it keep coming and hope she can keep running. It was weak and not unexpected.